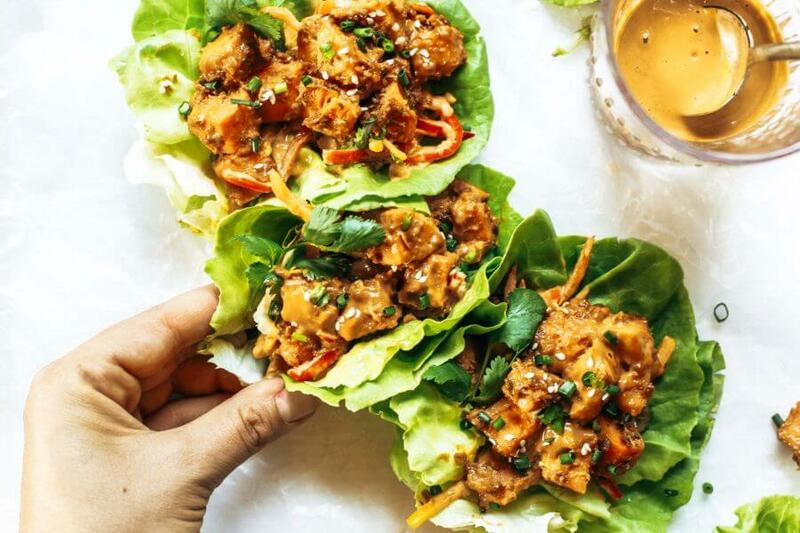 Whole30 lunch idea: these drool worthy thai lettuce wraps, stuffed with roasted sweet potato, rainbow mango slaw, and the best thai “peanut” sauce you ever had. 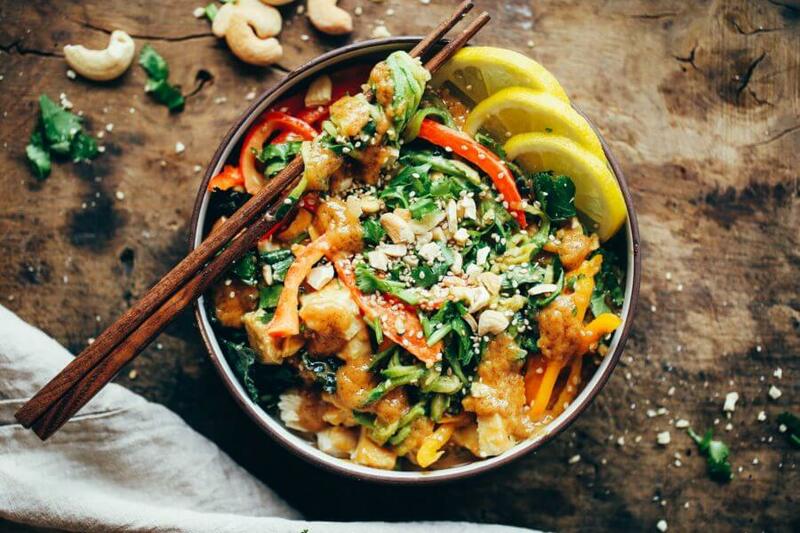 Easy, healthy, and delicious! A great paleo lunch for on the go. Protein: If you want more protein, you can sub half the sweet potatoes for chicken breast cubes or ground chicken. Puree ingredients for sauce in a high speed blender until completely smooth. Heat cast iron skillet over medium heat on the stove. Cook cubed sweet potatoes on medium heat in a little water or oil until soft- I cook mine about 15 minutes until golden on the outsides. Add half the sauce and cook for another 3-5 minutes until crispy. Then set aside. In a bowl add julienned peppers, cilantro, chives, diced mango, the rest of sauce and toss. Nutrition Facts Whole30 Lunch Thai Sweet Potato Lettuce Wraps Amount Per Serving Calories 340 Calories from Fat 189 % Daily Value* Total Fat 21g 32% Saturated Fat 3g 15% Polyunsaturated Fat 3g Monounsaturated Fat 5g Cholesterol 2mg 1% Sodium 445mg 19% Potassium 435mg 12% Total Carbohydrates 33g 11% Dietary Fiber 8g 32% Sugars 14g Protein 8g 16% Vitamin A 202% Vitamin C 142% Calcium 4% Iron 12% * Percent Daily Values are based on a 2000 calorie diet. Paleo and whole30 chili made with cauliflower. Full of flavor, healthy, and satisfying. The kind of home-cooked meal that makes you all comfy inside. Recipe can be made ahead and frozen. To add extra protein to this recipe, sub half the cauliflower for 1/2 lb ground hamburger and cook as directed. Add rest of ingredients (except cilantro) and cook until soup reaches desired consistency (about 8-10 minutes). Serve with fresh chopped cilantro. 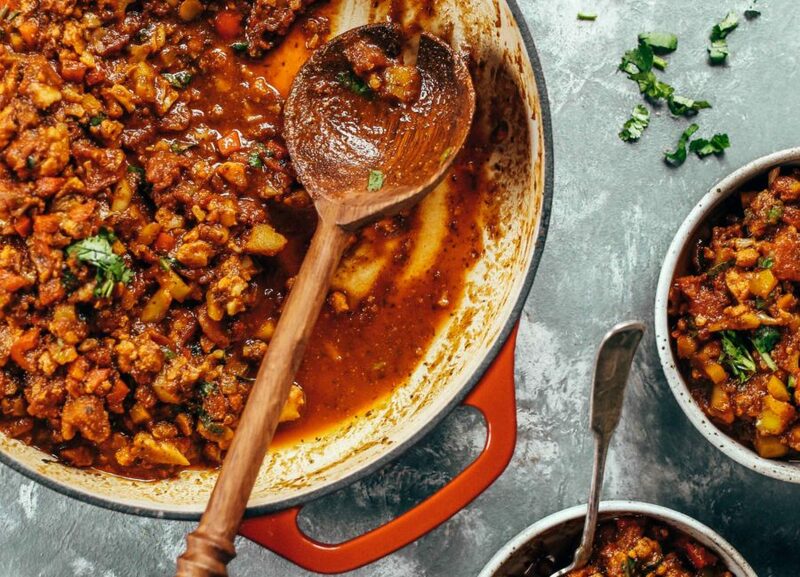 Nutrition Facts Best Easy Paleo Cauliflower Chili Amount Per Serving Calories 220 Calories from Fat 90 % Daily Value* Total Fat 10g 15% Saturated Fat 2g 10% Polyunsaturated Fat 2g Monounsaturated Fat 5g Sodium 924mg 39% Potassium 1114mg 32% Total Carbohydrates 33g 11% Dietary Fiber 16g 64% Sugars 12g Protein 7g 14% Vitamin A 135% Vitamin C 340% Calcium 28% Iron 73% * Percent Daily Values are based on a 2000 calorie diet. 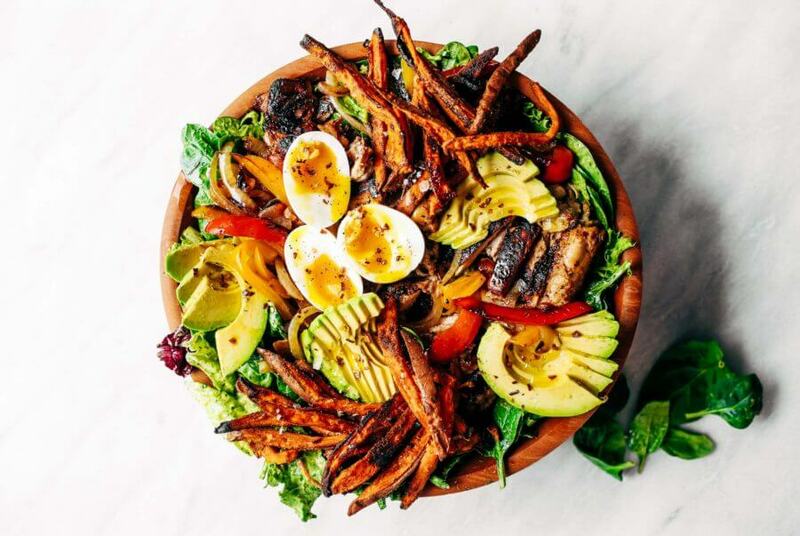 Fast and easy fajita salad loaded with crispy sweet potato fries, grilled chicken, and topped with creamy avocado dressing! 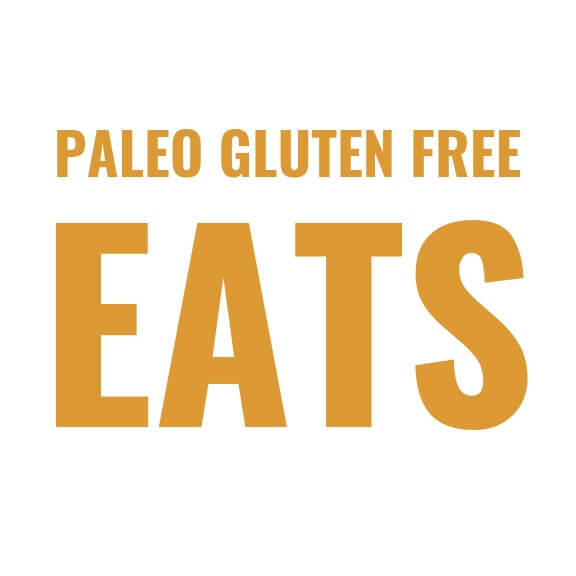 Paleo, whole30, and makes for easy meal prep! Blend marinade ingredients together until smooth. Pour marinade into a ziplock bag with the chicken thighs and marinade for two hours or as time allows. Grease a grill pan or skillet with olive oil and cook chicken fillets over medium heat, cook on each side until crispy and cooked through. Once chicken is cooked, set aside and allow to rest. Fry peppers and onion lightly in olive oil in a skillet over medium heat, until cooked to your liking. Preheat oven to 475F. Line a baking tray with parchment paper. Slice sweet potato fries into thin strips and toss in oil, flour, and seasoning. Bake fries on 475F for about 30-45 minutes until crispy. In a blender or food processor, blend ingredients for dressing until smooth. Slice chicken into strips and prepare salad with salad mix, avocado slices, peppers, onion strips, chicken, fries, and eggs. 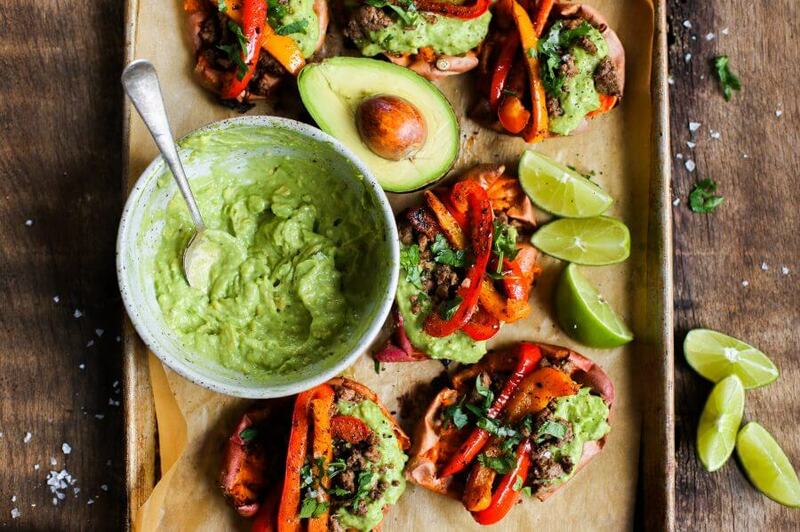 Drizzle with avocado dressing and serve. Nutrition Facts Grilled Garlic Lime Chicken Fajita Salad Amount Per Serving Calories 467 Calories from Fat 297 % Daily Value* Total Fat 33g 51% Saturated Fat 6g 30% Polyunsaturated Fat 4g Monounsaturated Fat 18g Cholesterol 143mg 48% Sodium 677mg 28% Potassium 883mg 25% Total Carbohydrates 30g 10% Dietary Fiber 6g 24% Sugars 9g Protein 19g 38% Vitamin A 262% Vitamin C 160% Calcium 9% Iron 31% * Percent Daily Values are based on a 2000 calorie diet.